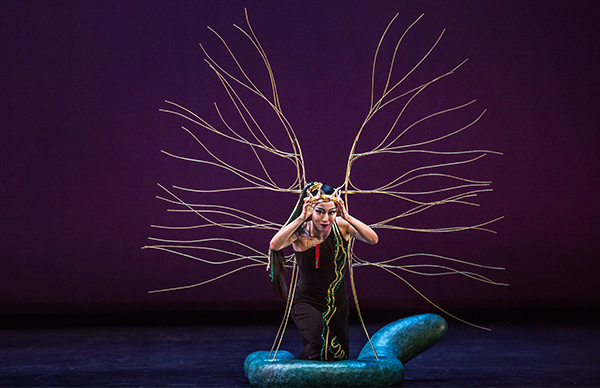 Premiered at Columbia University in 1946 and originally entitled Serpent Heart, this dance is a psychological study of the destructive powers of love, the dark passions that guard the human heart, coiled like a serpent ready to strike when attacked. Medea, princess of the kingdom of Colchis, was known as a sorceress. Pierced by Cupid’s bow, she fell in love with the adventurer Jason and used her magical powers to help him gain the Golden Fleece. Sacrificing all that was dear to her, she fled with him to his home in the kingdom of Corinth, where they lived as man and wife and had two small children. But Jason was ambitious, and when offered the Princess of Corinth in marriage, he abandoned Medea. This is the moment in which Martha Graham’s dance begins. Betrayed and exiled from her home, Medea plots a course that will end with the death of her rival, the Princess, and the murder of her own two children. The Chorus, foreseeing the tragedy about to be enacted, tries to prevent it, and suffers its unfolding. Graham’s dance confronts us with the horror of a woman betrayed, so crazed by vengeance that she commits the unthinkable, the murder not only of her lover’s new wife, but of her own children. She is the most detestable of beings, but she is not alien to us. In her exploration of these dark and primal passions Graham reveals the full range of what it is to be human. Ultimately this is a dance of transformation, as the Sorceress (Medea), cleansed by flames, is returned to her father the Sun.